This interview with Shaun Young was made in two sessions. The first part took place sometime at the end of 2001. This was before the release of “What Are You Waiting For” and the conversation turned around Shaun’s past band and influences. 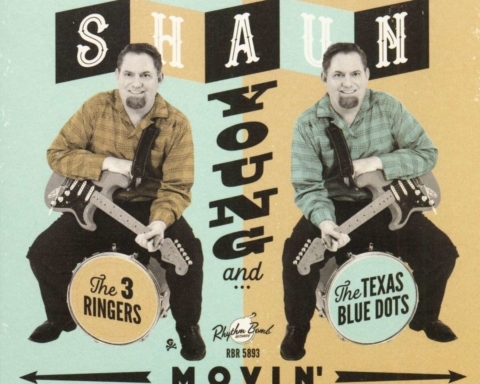 The second took place in 2006 after the release of “Wiggle Walk”, Shaun’s solo album and the succesful gigs of High Noon at Green bay and the Rockabilly Rave. I’d like to know how you became involved in rockabilly etc. Is it something that comes from your parents or are you a «self made» rockabilly boy? Shaun Young: My parents did have allot to do with it. 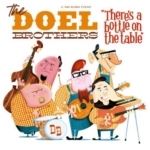 My Dad is a big Buddy Holly fan and both of my parents love the Everly Brothers. They would sing Everly songs in harmony together when I was young. They also sang tunes like Frauline by Bobby Helms, Mom liked Ray Price , George Jones and Elvis. After digging into their records I started to search out stuff myself and found out about Gene Vincent, Johnny Burnette, Sid King and all the classic rockabilly. You played in the Shifters before High Noon. Could you tell more about this band? Shaun Young: The Shifters was a teenage rockabilly band (not real good ) but it was a way to start to learn how to «play it right». I formed the band with some guys from school. Is there a connection with the Jinns? Shaun Young: After graduation we found out about a band in Denver called Bop Street. The Naulty brothers, Pete and Brian, were the core of the group who later formed the Jinns. They were a big influence, they were older and knew allot more about the music than us. Pete turned me on to Ronnie Self and Ronnie Dawson to name a few. It was through them I met Todd Wulfmeyer (guitarist for the Jinns and Marti Brom) and Kevin. They both joined the Shifters soon after. Now let’s talk about High Noon. How did you get together? Shaun Young: Sean Mencher was playing with a country band called Chapperal and they opened for the Shifters. Kevin and I were very impressed by his playing and song writing. He dug the Shifters energy, so we started talking about rockabilly and how we thought a band should sound. Soon after that and though a long series of events the three of us ended up jamming in Seans garage. We had so much fun playing Elvis Sun tunes and such we all decided this was the band we had all dreamed of. Did you find your sound immediately? Shaun Young: Yes and no. When I see old video of High Noon I’m surprised at how much we sound the same now as then. We did how ever evolve and refine the sound as we went along with becoming better players and song writers. I think we all had a certain individual style that just messed real well and produced a strong combined result. How did you meet Willie Lewis? Shaun Young: Kevin and I had heard his first record in Denver. We were saying «Who is this guy?» Then our old friend Todd Wulfmeyer found him and introduced us. Willie came out to some shows we did up in Colorado. 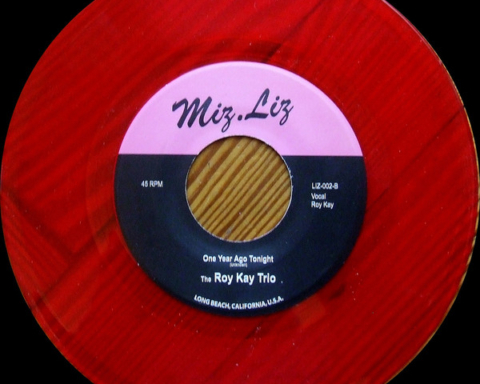 We told him how cool it would be to have a 45 rpm record out on Rockabilly records, and he agreed. He was the only record company crazy enough to put out a 78 rpm disc. There was this record with Beverley Stauber, wich came after your first release but it wasn’t exactly your sound. Could you tell me more about these session? Shaun Young: Man, what can I say about that mess. We were hired to back her up. I hate the way that thing was recorded. It was a huge studio with mikes everywhere. We were just warming up and goofing around when they recorded the songs I was singing. I didn’t know they would put them on the record. Beverley was a friend of ours and we were trying to help her out. Then High Noon stopped. Why? Shaun Young: We had been on the road for years, making no money, sleeping on floors, riding trains, and missing our family. Don’t get me wrong we loved to play music for every one who would listen and getting to see the world is something not every one gets to do. But it starts to wear on you when your always worried about paying the bills. Remember this was before the scene was as organized as it is today. We had to do every thing our selves. Seans wife Leslie booked and managed the band, with out her and Sean busting there humps we would have gone no where. Sean and Leslie then decided to move their Family up to Portland Maine. It was an chance for their three kids to go to good schools and be close to there Grandparents. So we just had to slow down. I don’t think any of us really look at High Noon as ever being broken up. We have way to much fun together to ever say the last show was the last. We just have differn’t prioritys and responsabilites to take care of. We will continue to make music together when ever the right opportunity presents it’s self. Could you name some of your major influences as a singer? Shaun Young: Buddy Holly, for both singing and writing, Gene Vincent, Tommy Duncan (with Bob Wills band) Tony Williams (from the Platters) are some favorite singers of mine. Shaun Young: For writing Hank Williams, and Harland Howard. After the High Noon days, we discovered Shaun Young the drummer. When did you start drumming? Shaun Young: I started drumming when I found some vintage drums at a local flee market. I got a great deal on them so I thought I’d better learn to play them. I always dug the drums and drummers like Gene Krupa and Dickie Harrel. So I would get a lesson from Bobby Trimble every time Big Sandy was in Austin and I picked up a gig playing with Marti Brom. It was trial by fire, either learn to play decent or look like a fool. That was in 93 or 94. It seems, especially on the Jive Bombers recordings, that you work hard to get the good sound and the way you beat the skins. Do you play on vintage drumkit? Shaun Young: I Have or have had three vintage kits I’ve recorded with. 1940 Ludwigs, 1949 Leedys and 1938 Slingerland Radio Kings. It is very important to me to have a good sound when I drum. I studied old records magazine articles and such to try to find out how the old guys tuned there drums. Then I tried to play with in that style. Shaun Young: Gene Krupa, Chick Webb, J.I. Allison, Jo Jones, Sid Catlett, Bobby Trimble is the best on the modern scene, too many to list! Let’s talk about the Jet Tone Studio. Is it true that this name comes from an airport wich was near the studio, and sometimes you had to stop recording while the plane were flying? Shaun Young: Jet Tone Studios was my extra bedroom. My wife Kristi and I lived right be the Airport and yes we did have trouble with low flying planes ruining recordings. Would you like to produce artists like Sean Mencher do? Shaun Young: Yes, I love to. Any body need a producer? Jet Tone Studio/Jet Tone Boys : how did you meet Marti Brom? Shaun Young: We met Marti at the local flee market. Her husband Bob just walk over cause he saw a greaser looking guy. I told him I had a band and Marti should come and sit in with us so people would find out about her. You also played with the excellent Jive Bombers? Shaun Young: The Jive Bombers came to be out of a band I played drums with called the Big Town Swingtet. It was a Swing combo (Two trumpets, trumbone, tenor sax, guitar, stand up bass, drums and a great female vocalist named Dana Dattalo.) We played gigs just for fun and had a good following. After Sean moved, High Noon wasn’t playing locally much any more so some of us decided to become more serious. We formed the Jive Bombers and then the swing craze hit. We played all the time and made good money while having a lot of fun. We weren’t really a swing band but more of a Jump blues band. Then Dana got a good job offer in Hawaii and left the band. I didn’t think it was worth it to replace her so we split up. 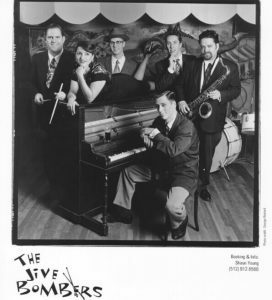 As a member of a Jump Blues/Swing/ Jive band, what do you think about those so-called Swing band that jumped on the success of the Swing revival? Shaun Young: There wasn’t to many good ones. I dig swing and when I say swing I mean Benny Goodman, Fletcher Henderson, and Count Basie. I never head any new bands that sounded like them. 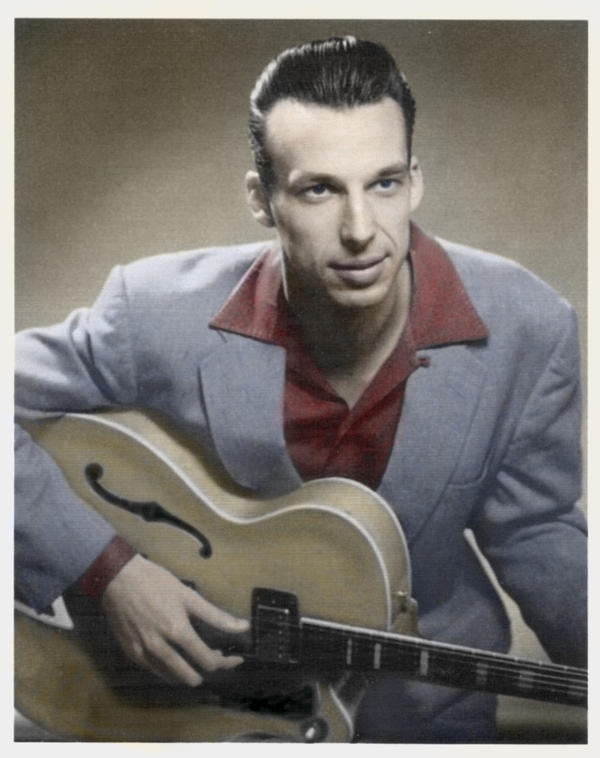 Do you still play rockabilly as a singer/guitarist ? Shaun Young: I still gig as Shaun Young with The Horton Brothers and drummer Buck Johnson backing me up along with guys like Leroy Biller on guitar and T Bonnta on piano when ever they’re available. 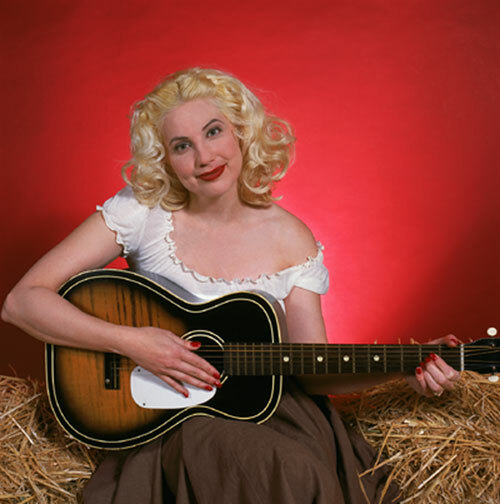 We play rockabilly and country tunes, a few new songs I’ve written, but mostly covers. We hardly ever rehearse and play purely for the fun of it. What about Shaun Young and the New Blue Moon Boys ? 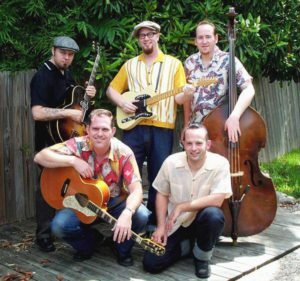 Shaun Youngg: The New Blue Moon Boys is a group that gets together twice a year to play an Elvis tribute show at the Continental club. The band includes: Bobby Horton on guitar with brother Billy on up right bass, Lisa Pankratz on drums, T Bonnta on piano, and the Lowels (Bill Bailey, Mike Heil, and Roger Wallace) singing back ups We start as a trio doing Sun stuff and then add drums and piano to play early RCA tunes. We end up with the Three backing vocalist singing the Jordanaires parts. Its a fun show to do. Shaun Young: My main projects of late have been building cars. I just finished a 31 ford model a Hot Rod and a buddy of mine in my car club, the Kontinentals, is customizing my 51 chevy. I’m having fun taking a break from playing music and mess with cars. It’s something I Haven’t had time to do for a while. I do have a new solo record in the can and almost ready for release. Look for it on Goofin’ records soon. Shaun Young: Just want to say what a thrill it is to be part of something like High Noon! Thanks to everyone out there! See ya down the road. Shaun Young: Yes, Ive become very busy with music again and it feels great after a bit of a break. Ive been doing some different things, playing electric guitar, writing new instrumental tunes as well as new vocal songs. Playing a bit more with the Horton Brothers backing me around Austin and having a blast with the new Surf band The Thunderchiefs! You’ve played some gigs with High Noon. How was it to play together again? Shaun Young: It is always great to play with High Noon, its heaven! Its kind of like riding a bike; we played for so long together that you just kind up pick up right where you left off. I just get swept away by the feel of that band. With just the three instruments it seems the music has a rhythm all it own. The other great thing about getting to play with High Noon is just getting to sing those songs. I think weve really written some nice songs through the years and I wish I got to sing them more often. High Noon’s return at Green Bay coincided with the release of “What are you waiting for?” your first release together for years. Was it important for you to come with new material? Shaun Young: Yes very important. The last thing any of us want High Noon to turn into is a reunion band playing all the old hits from the early nineties. You have to have fresh stuff, new songs, and new challenges. If youre going to do it, do it right. Thats the motto we try to live by. Shaun Young: Most folks probably all ready know about Kevin getting hired by Dwight Yoakam. Its a great opportunity for him, the big time and he deserves it! Sean and I are so proud of him. Well when Kevin got the call from Dwight we were all ready booked at the Rave so we had two choices. Either cancel or play with a fill in bass player. Playing with a fill in player isnt something we would normally even consider but when Jimmy Sutton said hed play my mind was at ease. High Noon is its own weird special thing and its hard for anyone to step in and play. Not that the music is complicated or no once else out there is good enough to fill our shoes or something, Im defiantly not saying that! Its more like the three of us have been screwing it up for so many years together it makes it difficult for some one to step in and groove like the band normally does. Does that make sense? Any way, weve know Jimmy for all most as long as High Noon has existed and of course we are BIG Jimmy Sutton fans so I felt like yeah, we can pull this off. Well Jimmy did more that just fill in and pull it off. He took it over and made it his own! That set wasnt High Noon with Jimmy Sutton filling in on bass it was High Noon period. Do you plan to record new stuff with High Noon? Shaun Young: You know, we do have some tentative plans that Im trying to sort out. I wish I could tell yall more than that cause there may be some exiting things in the near future for High Noon. Is that big enough of a tease? Ha ha. 2005 saw the release of your newest solo output “Wiggle Walk”. A word about the “genesis” of this record. Shaun Young: Wiggle Walk! That was a fun record to make! It was great to finally record a record with the Horton brothers, Dave Leroy Biller Buck Johnson and T Jarrod Bonta, the band that Ive been playing gigs with in Texas for ten years. Weve been gigging with that lineup ever since Billy and Bobby moved to Austin but other commitments have kept us form doing a record until now. Shaun Young, with Dave Biller, Billy Horton, Bobby Horton and Buck Johnson. I had a bunch of songs written that Bobby and I had been getting together and arranging. Bobby is my right hand man when it comes to fleshing out my song Ideas and Billy is a great producer and engineer in the studio. How can you go wrong with a line up like that? I cant say enough good things about all those guys and I have for pinch myself to make sure its real when Im singing in front of that group of top notch musicians! People seem to really like that album and we really appreciate all the great things folks have said about that one. One of the band you’re involved with are the Thunderchiefs. How did you come with the idea of a surf band? Shaun Young: Its a funny story. I used to play lead electric guitar when I was a teenager back in Colorado. Kevin and I had a band called the Shifters. 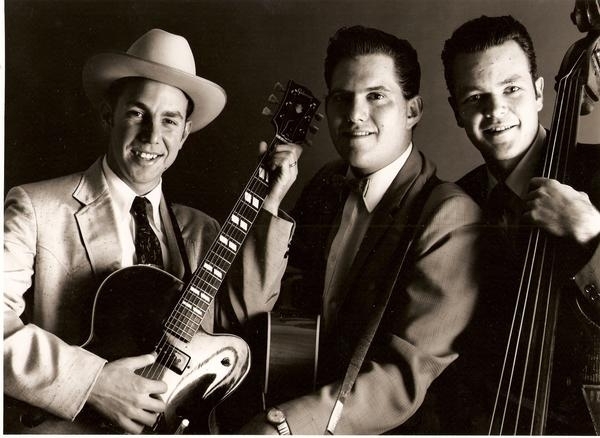 We were a typical teenage rockabilly band, loud fast and not that good! Ha ha ha. Well I had to play lead because we didnt know any other rockabilly guitar players.I was an ok guitar player but when we met Sean Mencher I thought heck I dont need to mess with this anymore, hes got it down! So its been like 15 or 16 years since Ive tried to play any electric lead guitar. Well about six months ago I bought a Fender Stratocaster and started to relearn a bunch of old instrumental guitar tunes I used to play as a kid. Typical stuff like Walk Dont Run and Pipeline.Well I was telling my buddy Joe Emrey I thought it would be fun to start a Surf band and play some of these tunes just for fun. Joe I a great Surf guitar player who had a band called Death Valley here in Austin back in the early 90s. High Noon used to play show with them quite a bit back then. He is now the singer and guitarist for a KILLER garage rock band called the Ugly Beats. 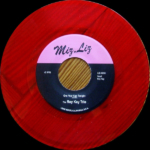 Any one who digs 60s garage rock needs to check out the Ugly Beats! Well Joe says that sounds like fun, I want to play bass! I thought that would be great since Joe has never played bass in a band before and Im not the worlds greatest guitar picker so this will work well. I figured If I just found a group of guys that wanted to mess around and learn as we went I wouldnt make any good players bored with my screw ups. Well, that whole plan went out the window when Bobby Trimble heard about it. Bobby is one of my closest friends and we always wanted to play in a band together. Were both big Surf music fans. Bobby just moved to Austin from California this past year and its great to have him living in Texas! Any way when Bobby got wind of or little plan he told me DUDE, Im playing drums!!! I thought well heck if Bobby is going to play the drums Id better get good fast or Im going to start to stick out! So we got together over at Joes house for our first rehearsal and had a ball. We new we need to find a second guitar player to fill things out. Well, thats when Mike Guerreo called Joe. Mike Is well known to Surf music fans as the incredible lead guitar player of the Austin Surf trio The Sir Finks. Their Boss Guitars of the Sir Finks album is one of the best modern surf records ever! Mike hadnt been playing much since the Sir Finks, spending time raising his family and such. Mike tells Joe he wants to play guitar with us. When Joe Told me that I about fell on the floor! Thats like starting your first rockabilly band and having Cliff Gallup call and say he wants in the band. So suddenly we had a very good Surf band put together. All of us have been writing original songs for the group and we start recording our first album next month. It will be out on Wormtone Records This summer. Any one whos interested can check the band out on myspace. It was a fun band to play drums in, very Bill Haley and the Comets type of feel. With all those bands, do you still find to build cars? Shaun Young: Not as much as Id like! I still take time to mess with my cars any chance I get. I love my hot rods. Working on them, driving them, taking the roadster and racing at the drag strip are my big escapes from the stress of life! Shaun Young: Thunderbird um I mean Thunderchiefs! Just a thank you to all the fans who like what I do. Im still in shock that any one even cares about my little music projects and I really appreciate all the support. Share the post "Shaun Young (High Noon, Thunderchiefs…)"